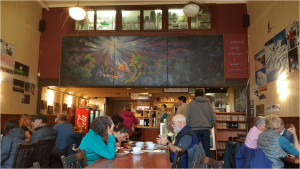 Upon entering The Rookery Cafe, customers are invited to walk up and place orders beneath a beautiful chalky mural featuring the anticipation of wonder. While there, grab your own glass of water in a simple mason jar. Then grab your seat among the aging wooden tables. The long tables encourage you to get to know your neighbors while waiting for your meal. Your warm beverages arrive in wide ceramic cappuccino cups. 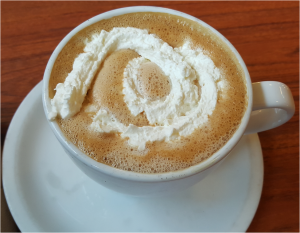 Grumpy ordered a cafe mocha with an extra shot of espresso adorned with a spray of whipped cream. I enjoyed one of the best chai lattes I’ve had in a long time. The unsweetened tea was not too sweet nor overwhelmingly spicy. It was admittedly the perfect warm drink for a chilly morning. While we waited for our food we watched other orders arrive. Every dish looked wonderful, arranged creatively on each plate. Waiters served French toasts made with thick slices of bread generously topped with whipped cream and fresh strawberries. 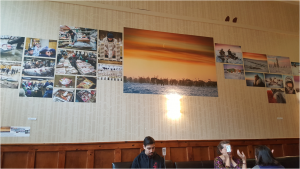 Also while waiting, we admired the many pictures of life in Alaska. After waiting about 15 minutes for our food and nearly emptying our drinks, we received plates to die for! 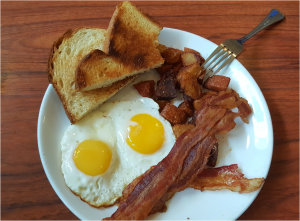 Grumpy ordered the Two Egg Breakfast and I ordered the Eggs Benedict. It was delicious. The potatoes are seasoned with a paprika and salt spice that had just the right amount of salty crisp. 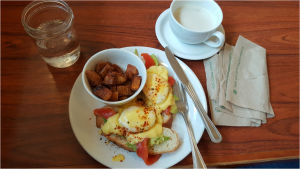 The soft poached eggs offered a nice warm golden sauce to the toast loaded with egg, smoked salmon and avocado. The only drawback would be the length of time waiting for your meal. Surely the popularity of the place and the care made to the creation of each plate results in the need for extra patience for the arrival of the food. 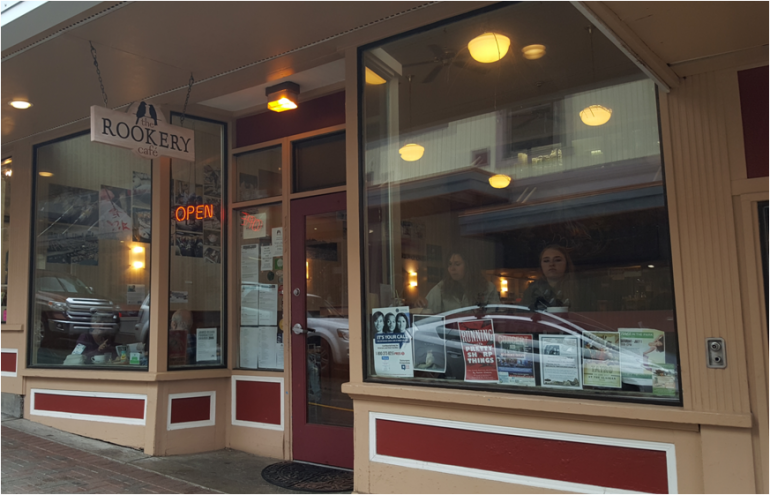 Even so, if this were the only place I would eat at in Juneau, I would be happy. I’d been hearing great things about the Rookery so I couldn’t wait to get in and try it out. I was a little disappointed. The service was not very friendly. I was a first timer and it showed but I expected some assistance in ordering and all I got was impatience. I had hoped the food would make up for it but I was underwhelmed. Ordered the Adobo Loco Moco. As a person of Filipino decent who moved to Alaska from Hawaii this seemed right up my alley. While it wasn’t bad it wasn’t something I would not order again. The Italian soda’s were also not very good. I may go back to the Rookery to see if it was just a bad day but I will definitely not have my hopes up.